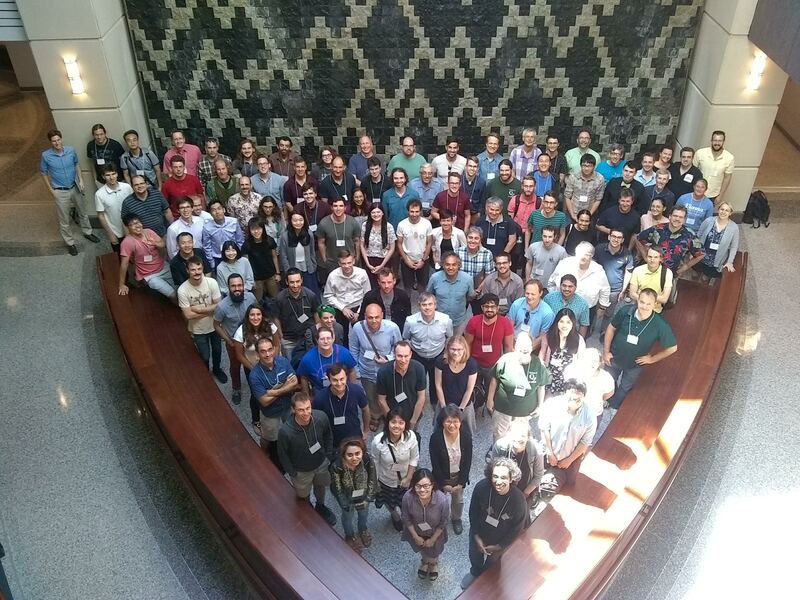 Can you find me in this picture from July's ANTS conference in Madison, Wisconsin? Hint: I am easier to spot than normal. They're up to 23rd! That's the good news. The bad news is that Celtic dropped out of the Champions League. That is not bad news for the coefficient per se (since they drop down to the Europa League), but it is bad news for the club's budget, will which affect their competitiveness in future years. So it was a mixed bag. Celtic only picked up 0.125 in being bounced from the Champions League. Rangers picked up 0.375 in advancing. And Hibs managed 0.125 on their way out. Blame was being thrown around, but I think they just weren't good enough to make it any further. Anyway, the 3.25 so far is more than Scotland earned in their terrible year three years ago. And they still have two clubs alive! The goal of 5-6 points per year is achievable (if not necessarily likely) this year. Rangers (Elo 1421) faces the Russian club FC Ufa (Elo 1575). Clubelo.com gives Rangers only a 25.6% chance of advancing. Of course, they were underdogs in the last two rounds as well, so the Elo may not tell the whole story. Celtic (Elo 1534) takes on Lithuanian Club Suduva (Elo 1278). Clubelo gives Celtic a 85.4% of advancing to the group stage. One would hope it would be higher, but this Celtic club does not seem as strong as the ones from the last two years. After only two league matches, they are sitting in sixth place. The only thing that seems at stake here is Rangers advancing to the group stages, however many points they pick up. Having both Old Firm sides in the group stage of the same competition would be delicious. So a good result is having both sides advancing. That's a minimum of 0.5 more points, but more likely at least 0.75. A bad result would see Rangers out, but Celtic advancing. Rangers wouldn't pick up anything on their way out, and Celtic would drop some points. Say 0.25-0.375 total. A disastrous result would have both sides out. Even picking up 0.5 on the way out, it would be a disaster. They're in 23rd now. Looking above them, Belarus' BATE Borisov is still in the Champions League (thus guaranteed a group stage of some sort). Serbia is also going to be tough to catch, being the only other nation with two teams alive, and one of those is in the Champions League. So I'm going to set 21st as a realistic upside for this year. We won't think about the downside until the group stages are set. That went very well! How well? The 2.625 points Scotland have picked up so far this year is second only to Serbia. I fell compelled to point out that the giants are Europe are just starting to enter and will inevitably pass Scotland, but among those not in the top 15, it's hard to top this performance! I said a good second round would have one Europa League team advance, and a total of 1.375 points. They got 1.25 points, but with two sides advancing! And Celtic staying in the Champions League. Pour one out for Aberdeen, who took Burnley to extra time. When you're in a situation where one goal falling differently would have knocked out a Premier League team, you have to give respect to Derek McInnes and his squad. Still, Aberdeen bows out with only having contributed 0.125 to the coefficient this year. That's the first time in their five-year streak of qualification that they've contributed less than 0.625. Hibs started out with a 3-2 win at home over Asteras. That result was not entirely surprising; the real triumph came with the 1-1 draw on the return leg. They actually probably should have picked up more points, since they held a one-goal first-half lead against a 10-man side. Rangers won 1-0 on the road in Croatia. That put them in command when Osijek visited Ibrox last week. A 1-1 draw was enough to advance, but would have produced more points if not for a late own-goal. If we celebrate Aberdeen for being one goal from advancing, we should note that Hibs and Rangers were each one goal from going out. But those are the breaks, and for once Scotland got them. One Scottish side not in need of breaks was Celtic, which cruised to a 3-1 win at home before settling for a 0-0 draw for a relatively easy dispatching of Rosenborg. Hibs, whose Elo is up to 1325, faces Norwegian side Molde (Elo 1423). So Neil Lennon's side has about the same chance (33.2%) as they had against Asteras. Given the way Hibs (and Scotland in general) have been overperforming this year, I wouldn't count them out. Similarly, Rangers has an Elo which has risen to 1385, and they take on Slovenia's Maribor (Elo 1499). So Clubelo.com gives them a 31.8% chance of advancing. Again, if we look at the probability that at least one of the two advance, we're better than 50/50. But the chance that both do is 10%, unless we believe that Clubelo is underestimating Scotland this year. Celtic (Elo 1548) faces another tough road against Greek champions AEK Athens (Elo 1605). The mismatch is not quite as severe here, giving Celtic a 42.6% chance of advancing. So let's say a good round has Celtic advancing in the Champions, and one of the two Europa League sides continuing on, and I'll not be too greedy in asking for half of the possible 1.5 points towards the coefficient. A bad round would have Celtic be the lone survivor, in the Europa League, and I could see Scotland picking up as few as 0.25 points. It bothers me that this is not just the fourth round. If Celtic can get past AEK, they face either Swedish champions Malmo (Elo 1502) or Hungarian champions Vidi (Elo 1435). Celtic would be clear favorites to advance to the group stage against either. If they can't, they are pretty much a shoo-in for the Europa League group stage, as they face the winner of the tie between Latvian champs Spartaks Jumula (Elo 1138) and Lithuanian champs Suduva (Elo 1264). If Rangers advances, they face either FC Ufa (Elo 1569) or Niederkorn (Elo 1104). So that doesn't look good for making the group stages. If Hibs wins, they get either Zenit (Elo 1724) or Dinamo Minsk (Elo 1442). Unless there are some major upsets, I don't see anyone but Celtic being in the group stage, which is a shame. It's more important, I think, to lay a groundwork for advancing in future years (although letting the Cup winner skip the first round in 2020/21 is a bonus). I think 5 points needs to be the goal, and they're over halfway there. If we look at the preliminary 2021 rankings, which includes that last two good years along with this year's results so far, Scotland is 20th. While that shows progress, it also shows that a consistent 5 point is needed to get back into the teens. If Celtic can manage a comparable run to last year, Scotland should exceed 5 points even without contributions from the other sides. If the Scottish draw hadn't been so rough this year, I think the quality they've shown would have even more promise.